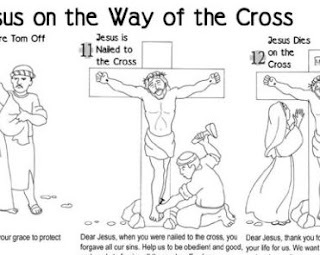 It’s a great idea to go over the Stations of the Cross with children during Lent. 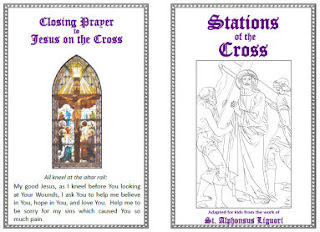 When we find ourselves traveling on Good Friday (to be with family on Easter) I always print a Stations of the Cross booklet to take with us so we can pray them on the drive. 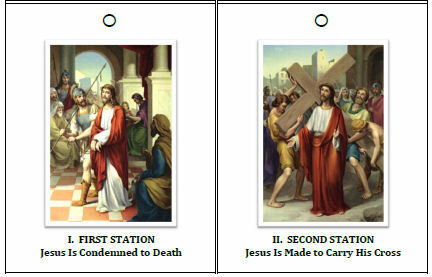 Here are some printable resources for the Stations of the Cross that are all free! pages, and they’re really beautifully done! I found these lovely stations over on Family in Feast and Feria. big, small, booklet form, or as cards to put on a ring! Isn’t that awesome?! illustrations. Perfect for little ones! Stations of the Cross Eggs– this is one of my favorites!!! Stations of the Cross CD For Kids– One of my favorite resources! We used the first Stations you wrote about, and found small objects to represent each one. Last year, my daughter used it as she walked through our church praying the Stations. She keeps it all together in a small little box. I love your ideas but being all thumbs when it comes to crafts I can't figure out to assemble this pocket size stations of the cross. Yes, I can fold but how do I attach them all together. I was unable to find the link with directions. 2. Lay out first half of stations in a line. Overlap 1/4 inch paper between Station 3 and 4 and tape. Lay out 2nd half and tape between Station 11 and 12. 3. Put the 2 strips of paper back to back and tape in several places to hold together. 4. Fold along the double-sided strip alternating between "mountain" and "valley" folds. The first fold of the book cover/Station 1 is a left-facing, mountain fold. This is opposite how a book would usually open so this may be confusing initially. I approximated my folds midway between the adjoining pictures. 5. This makes an "accordian-style" booklet when put together. The book cover is on the front and Station 7 is at the back. As you read it, flip it over to read the back side. Hope this is helpful! I cannot believe all the wonderful ideas!!! You have inspired my artist that had run dry-and kept my wallet (and my husband) very happy. Thank you-am spreading the word like the crazy mother I am!!! I just found your blog and love it! We used the printable stations (the small ones to put on a ring) today in class. I made two sets, and whited out the number and name of the station on the photos. We divided our class into two teams, mixed up the cards and had them put them in order on the floor, and then on a binder ring. Lots of fun! Thank you – been looking for something to use with my students that are not the old white books. I found some for older students but no one seems to have younger student versions. Hi Lacy, thank you so much for the two-page printable Stations of the Cross. I’m a first grade PREP (some Catholics may still call this CCD) teacher and most printables I think are too strong in design for these little ones. These printables are perfect! God Bless you Lacy I hope that you are blessed with a lot more ideas. 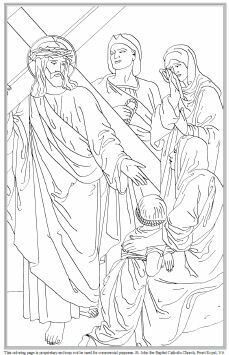 I wanted to get your Stations of the Cross and instead of printing them in as a page may I print them in not card so that I may make a small booklet to put it in a lapbook that I’m trying to put together. When I figure how to put everything that I’m making on the internet and be able to put them on the web to be printable I will give all my ideas. I don’t mind at all I will help as many as posible. This is for my kids. THANK YOU!!! I’m presiding in our Little Church tomorrow with the youngest group ages 3-6 and I really wanted some great visuals for them!!!!! I’m so glad you posted the updated link!!! Hello, I wanted to use the St.Johns stations for teaching CCD tonight but when I click on any of it google gives me a malware warning saying the site is no good. Just wanted to let you know. Thanks! So disappointing! Those were a cute set. Hey – just wanted to note that the link to St. John’s Church is not good. When I click on it my computer says that malware is behind the link – ??? My grand daughter goes to church with us when ever she is in town. She kept looking at the Stations of the Cross and was asking about them. I did have a rosary card with all the Mysteries and explained to her the Sorrowful Mystery. The Stations for children explains it much better then I can. She is 4. Thanks- can’t believe I forgot to add the link. lol. Thank-you so much! I will use the last one with my children on Good Friday. I have 3 children who are adopted and have great attention difficulties. While everyone is very tolerant of them at church, I am concerned that their antics would disturb the solemnity of the Good Friday services, so I really wanted to do something with them at home…and now I can!